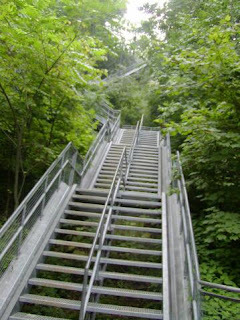 Well its two days after the big stair climb marathon and I feel great! It was a great feeling to finish something like this, and I hope to do it again next year with more participants. was fun climbing outside in November. It was a sunny day and it was quite mild outside. (14 degrees celcius) -Around 35-40 degrees farenheit. The climb felt great! I made great time and felt pretty decent until around the 30th time going up. If you check the results page and go under the results for this race youll notice that my times got slower as I got more into the climb. But take a look at the 30-34th time up and I am right around the 5 minute mark per lap. My legs felt like lead at this point and it seemed i was hitting the wall as i felt my blood sugar levels crashing. I remember around the 30th lap I asked for some G2 gatorade. After In gesting it I felt slightly better. After finishing the 34th lap I was done, my legs were burning and the lactic acid burn was incredible. It was a good feeling thou, finishing the climb 2 hours and 18 minutes. Next years goal I would like to go under 2 hours and 10 minutes. Ill keep you updated on my training, but for now I am taking a month off of hard stairclimbing and just focusing on increasing core and functional strength.